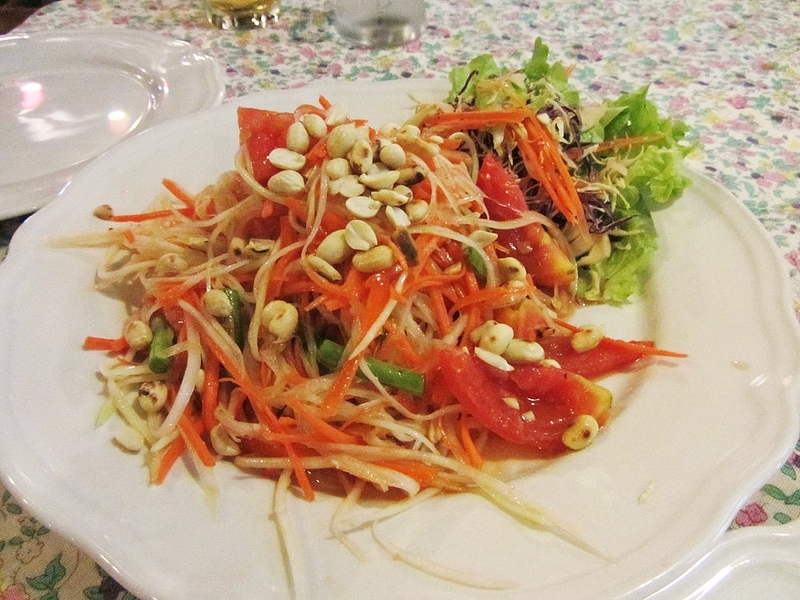 Continuing on from Part One of what I ate during my brief trip to Chiang Mai, Thailand, here's the second (and last) installment! The dish above was actually one that I built myself at my hotel's buffet lunch - and I did a pretty nice job if I do say so myself! 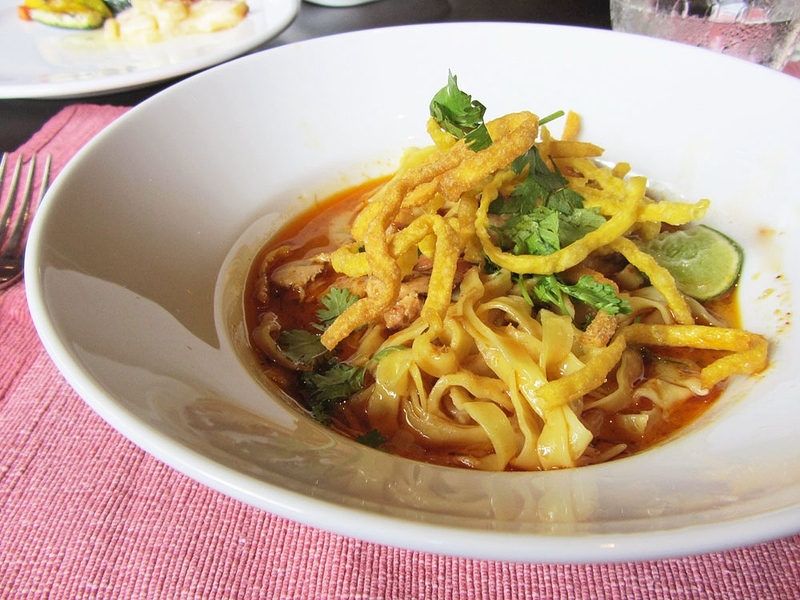 The broth was a really spicy chicken curry soup, then I added cooked egg noodles, a squeeze of lime juice, fried noodles, and cilantro. It was super spicy and definitely got my nose running, but I really loved it! I didn't eat a lot of desserts on my trip, but the dessert spread at the buffet was too hard to resist! 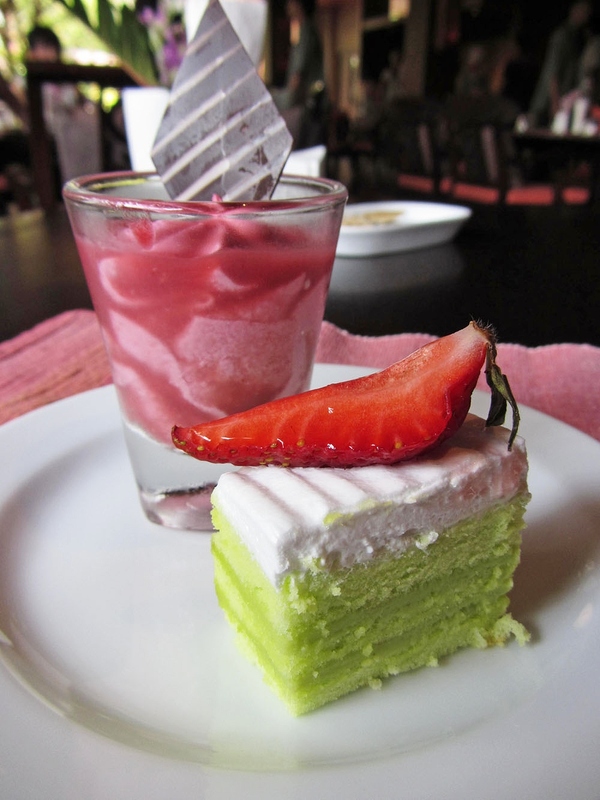 Pictured above is a blueberry mousse cup, which I got just because it was so pretty, and a pandan cake, which I had to try because pandan desserts were everywhere in Thailand! From what I understand, pandan desserts are made with pandan leaves, which are used to flavour and colour desserts in several Asian countries much like we would use vanilla here. The taste of pandan desserts is pretty unique and very hard to describe - the cake I ate it in was very sweet and coconutty, but my sister also tried pandan popsicles and jam while she was there. I'm going to have to keep pandan in mind for next St. Patrick's Day, if I can manage to find it here! For our last dinner in Thailand, we went to Dash! Restaurant & Bar because it was rated #1 on Trip Advisor. It was in a beautifully designed building and the staff there were so welcoming and friendly. My pictures of the food aren't going to do it justice because it was really dark out, but the food was delicious! We both absolutely loved it - it was fresh, crunchy, and full of flavour with just the right amount of spice. For my main course, I had to order pad thai because it was my last chance to order it in Thailand! Again, my picture doesn't do it justice, but it was so good! They gave me a gigantic plateful which I sadly couldn't finish. I really wish I could have brought it back home with me! Mango sticky rice was everywhere in Chiang Mai, especially at street vendors, but on the last day I realized I hadn't tried any yet so I grabbed the little dessert from the buffet. 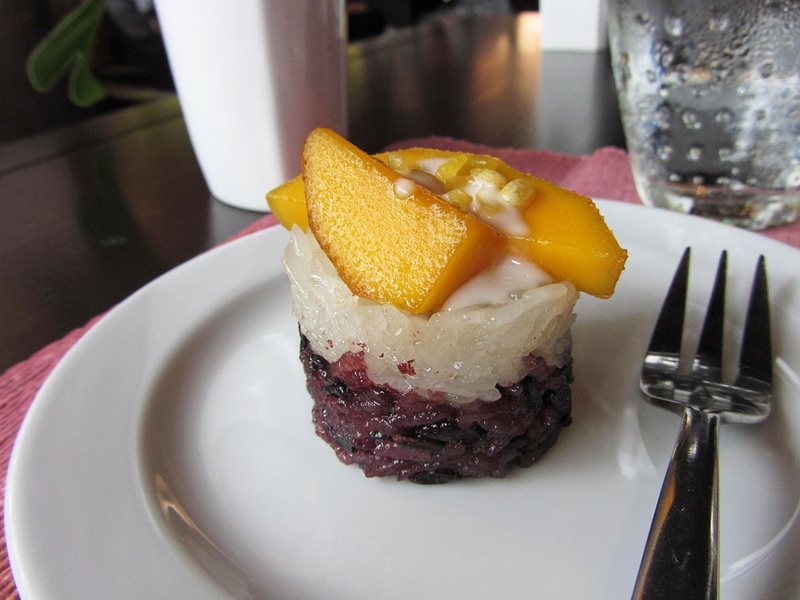 The sweet rice and ripe mango were delicious, but the coconut cream drizzle on top was to die for! 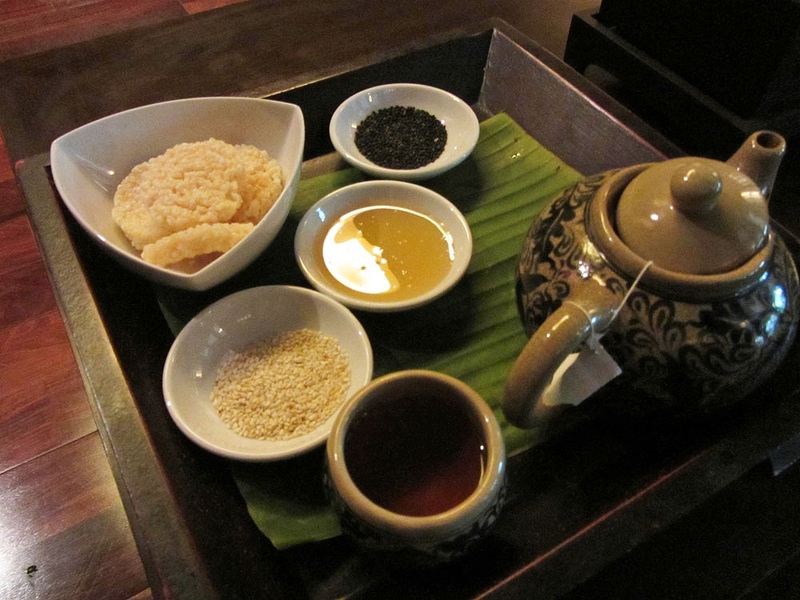 I think I may have to try to make my own mango sticky rice at home some time - hopefully it's not too hard! 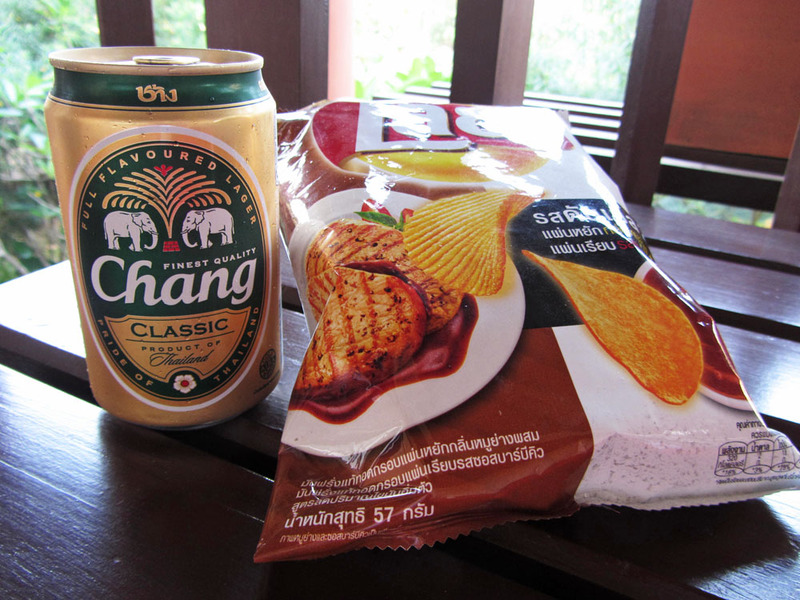 Sadly, we had less than four days in Chiang Mai before we had to head back home. The trip home was too long to count: we flew from Chiang Mai to Singapore, then spent the night at the airport there (about 9 hours), flew from Singapore to Tokyo for a brief layover, then flew the longest portion of our flight home to Toronto. 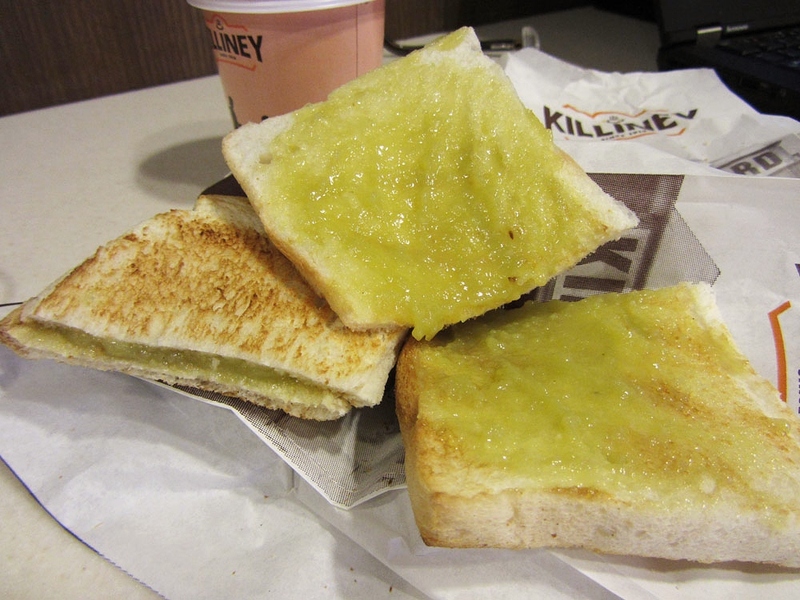 During our long night at the Singapore airport I decided to try kaya toast, which is really popular in Singapore, but I'd somehow missed trying it when I was there earlier. Kaya is like a jam, but is made of eggs, sugar, coconut milk, and pandan, giving it that familiar green colour. It's really sweet but is quite tasty - I actually had it twice in the airport, the other time it came with an embarrassing amount of butter which I won't post the picture of! 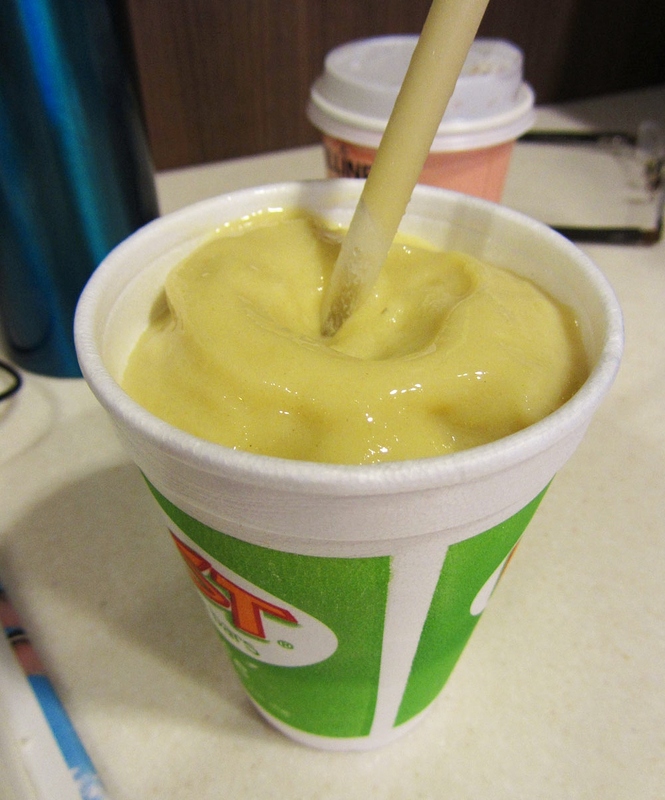 It contained mango, mango nectar, green tea, vanilla yogurt, sorbet, ice, and an "immunity booster" made with zinc, echinacea, vitamins A & C, and more green tea. It was really, really good, and I think the immunity boost worked because I was seated next to two people with colds on the plane and so far I don't show any signs of having caught it! When we stopped in Tokyo on the way home, I wasn't very hungry but felt like I would regret it if I didn't take the opportunity to try sushi in Japan! 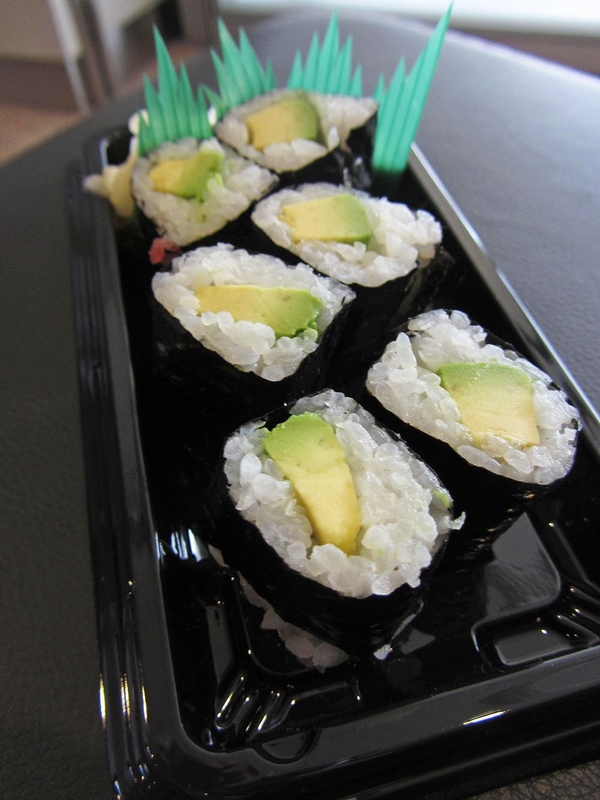 Unfortunately, airport prices are a little ridiculous (a California roll was about 20 bucks), so I ordered the cheapest one I could see: avocado. I was hoping Japan's sushi would somehow taste infinitely better than what we get at home, but this tasted about the same - I guess it's pretty hard to make basic avocado sushi taste special! It was still good though! Now I'm home safe and sound and trying to get back into my regular routine, which will include getting back to regular recipes on the blog soon! I had a wonderful trip and really hope to be able to return soon to see a lot more, but for now I'm happy to be home to my boyfriend, family, bed, and kitchen! 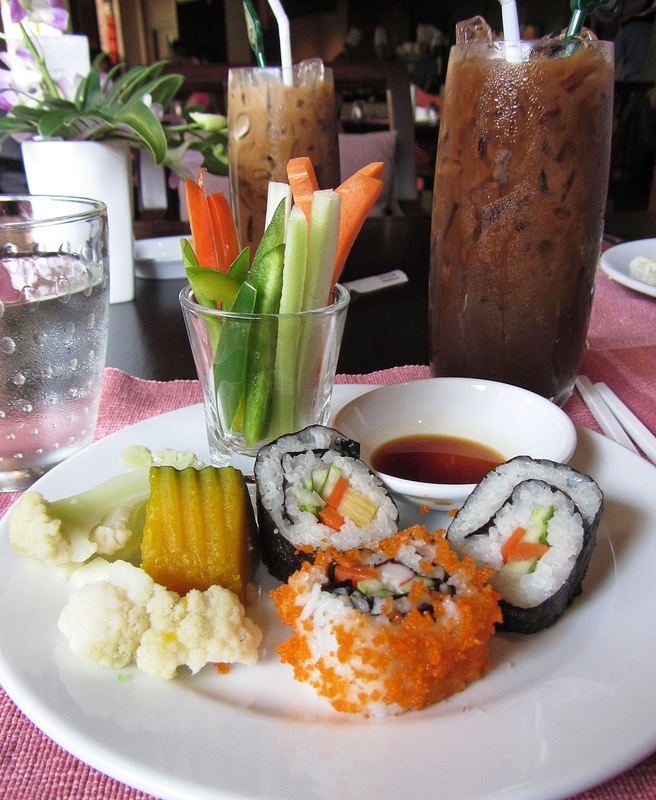 And if you're interested to see more, check out my sister's posts of what she ate in Singapore and Thailand too! I would TOTALLY have to have pad thai too! I'm going to a restaurant in SF I've been dying to try for a couple years on Wednesday and ordering their pad thai. I can't wait! Looks like you ate a lot of cool authentic food! I felt guilty whenever I ordered pad thai because it seemed like such a tourist thing to do, but I really love it! I'm happy I also tried other authentic foods though, I found a lot of other dishes I love too! 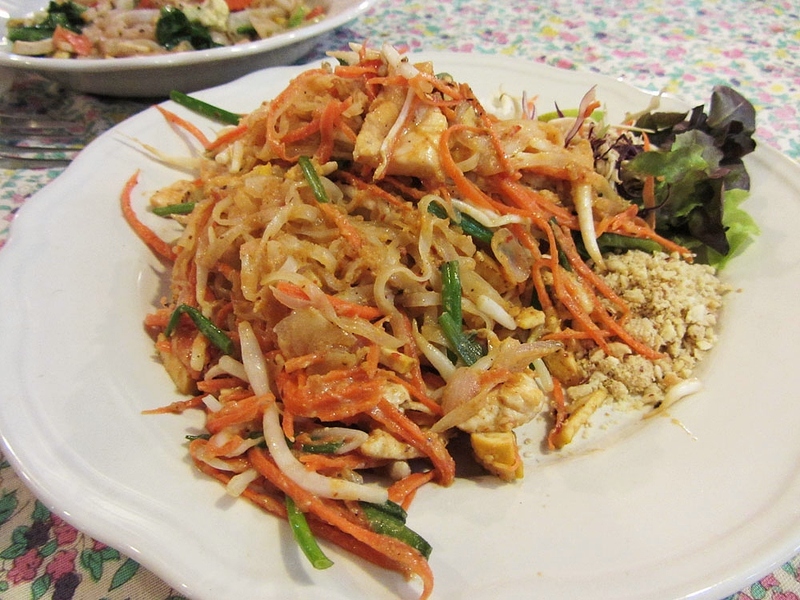 Pad Thai is my go to order when trying a new restaurant, so completely with you there. Mango and sticky rice is pretty easy to make at home, need to get sweet rice, soak it, soak it, them steam with sugar, coconut milk and a pinch of salt. Sweet, salty, tart, greatest desert ever!! I want to devour ALL of this!! Especially the desserts. Thai desserts have all of my favorite flavors - coconut, mango heaven. So nice of your sister and yourself to share this with us. Thanks so much! Haha yeah it seemed to be on every menu but I felt like it was only there for the tourists .. But I agree, it's too good not to order! Love all of your posts about Singapore & Thailand :) You've inspired me to travel to Asia. I've always wanted to see Japan, but have really not had plans to visit South Asia. Definitely on my "wish list" of places to travel now! The food looks incredible. And I MUST see elephants!!! It's funny, I've never really had a desire to go to Japan, but I always wanted to go to Thailand.. Although one of the reasons I wanted to go was for the amazing beaches and I ended up going to a city that wasn't on the water! But also the food there is all right up my alley, whereas I feel like I'd have a harder time finding food in places like Japan or Korea. I definitely want to go back to Thailand now and see a few more cities - it's so cheap so the only hard/expensive part is getting there!